Notify me when stock is ready! Join our newsletter too for deals and promotions. This item privilege for Member only. In stock and ready for delivery. How to entitle for free shipping? Free shipping for purchase of RM 1,500.00 item(s) or above! * Not applicable for Silver Buy Volume 500oz, Monster Boxes and Gold item above 50 grams. 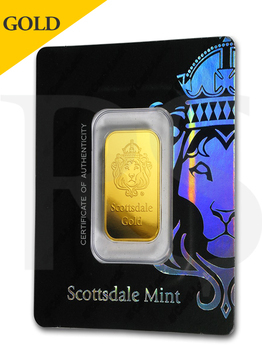 The world famous lion hallmark Scottsdale Mint announces the release of its NEW line of gold bars! These .9999 fine gold bars are beautiful, sleek, and incorporate a clean design co-branded with Swiss partner Heraeus makes it LBMA certified. The obverse of each bar features the iconic Scottsdale Mint Lion. The reverse features the crossed flags of the United States of America and Switzerland, signifying the power and partnership of this line of gold products with ISO 9001-2015 between the American precious metals company Scottsdale Mint and the Swiss-based precious metals company and LBMA member, Argor-Heraeus. 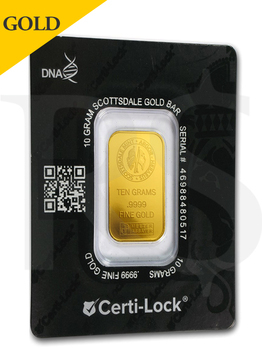 Certi-Lock® is a revolutionary approach to the authentication of precious metals. Through Certi-Lock's use of technology and free smartphone apps, consumers now have the power to verify the authenticity of Certi-Locked® precious metals at their fingertips, anywhere in the world. To learn more about Certi-Lock®, please view the following video. Separate multiple emails by comma ","
Live gold & silver pricing online store, probably among the first in Malaysia. Reliable and brilliant service, 2 thumbs up! - CK Wong, Co-Founder of ecInsider.my. Friendliest trader I talked to. Cheers. - Ng, Facebook.